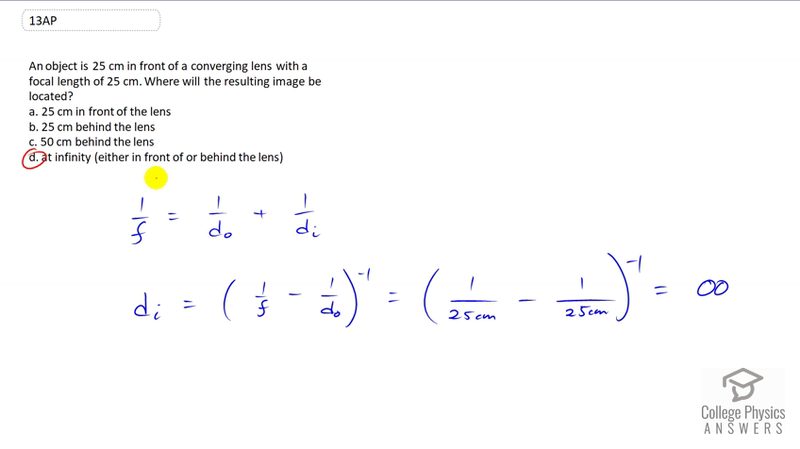 An object is 25 cm in front of a converging lens with a focal length of 25 cm. Where will the resulting image be located? This is College Physics Answers with Shaun Dychko. An object is 25 meters in front of a converging lens that has a focal length of 25 centimeters. So, we can figure out where the image will be using the thin lens equation and we'll subtract one over Do from both sides. And then, we have the image distance then is one over focal length one over object distance all to the negative one because that's the next step I did here. Raise both sides to the negative one to solve for Di. And so, that's one over 25 centimeters and this focal length is positive because we're told that it's a converging lens. If it was a diverging lens, we would have substituted negative 25. So, that's one over 25 minus one over 25, which is one over zero, the reciprocal of which is as infinity. And so, the answer is D.